Historically, whenever a commodity appreciates to all-time highs, pundits and naysayers are quick to forecast its eventual demise. Having tripled in value within two years, cobalt is now (once again I may add) being subjected to that same sentiment. However, despite the cobalt obituaries, there is an undeniable reality here: while battery manufacturers are indeed optimizing their chemistries, research suggests there simply isn’t an easy solution to eliminating cobalt from a lithium ion cell without a trade-off, such as performance or safety. Combine this with projected growth in other sectors that use cobalt (think jet engines and magnets that provide the electric motors for our new electric vehicles [EVs]) and forecasted demand for cobalt is as robust as it has been for many years, if ever. While it’s true that cobalt’s meteoric rise has made everyone take a hard look at supply and demand fundamentals, we need to take a step back and realize that this is not the first time that cobalt has appreciated in value. Just 10 years ago, in 2008, cobalt hit US$50 per lb., thanks to the birth and rapid spread of the smartphone. Despite its high price, cobalt was not engineered out of phone batteries nor did it curb our appetite for what has become the standard technology for personal communications across the globe. In fact, while there were some attempts to lower its content in consumer electronics batteries, cobalt demand actually increased. In 2008, the global cobalt supply and demand market was approximately 50,000 tonnes per year, with China not yet a significant player. At the time, a number of industry commentators were particularly vocal in their skepticism that cobalt supply could meet the demand created by cellphones, camcorders and laptop computers (collectively referred to as the three Cs). They predicted significant shortages and stressed the likelihood of cobalt eventually being sidelined. This was obviously not the case because in 2017, cobalt production surpassed 100,000 tonnes per year to keep pace with demand. Current and future production is not capped at that 100,000-tonne mark. There are untapped resources and there is further room to increase production. However, it is important to note that cobalt supply is closely tied to copper and nickel production. To bring new sources of cobalt supply to the market will require economics that can support these operations and an acceptable return to the investor. If a resource is developed to bring cobalt production on, the incentive price for nickel or copper will have to support the investment because that is the economic driver. The sentiment and approach to cobalt that took place with the smartphone explosion in 2008 may have similarities to the anticipated electric vehicle explosion. Given the cycle time that carmakers need to introduce products, combined with the supply-chain complexity in mass producing millions of cars, industry indicators suggest it is highly unlikely and bordering on impossible that lithium ion batteries containing cobalt won’t be powering EVs for the next five to 10 years, at the very least. Despite intentions to lower or eliminate cobalt from batteries, our research shows cobalt use in batteries is increasing. If one factors in all of the lithium iron phosphate batteries being phased out in favour of NMC cells, and the trend to increase battery pack size to meet range expectations, real cobalt consumption remains, even if cobalt content per battery is on the decline. Coupled with the fact that lithium ion cell-makers are investing billions of dollars to create cell capacity (specifically NMC formulation), we believe — despite daily media releases about new cobalt-free chemistries — that we can expect batteries containing cobalt to be the transportation workhorse, as internal combustion engines are phased out. 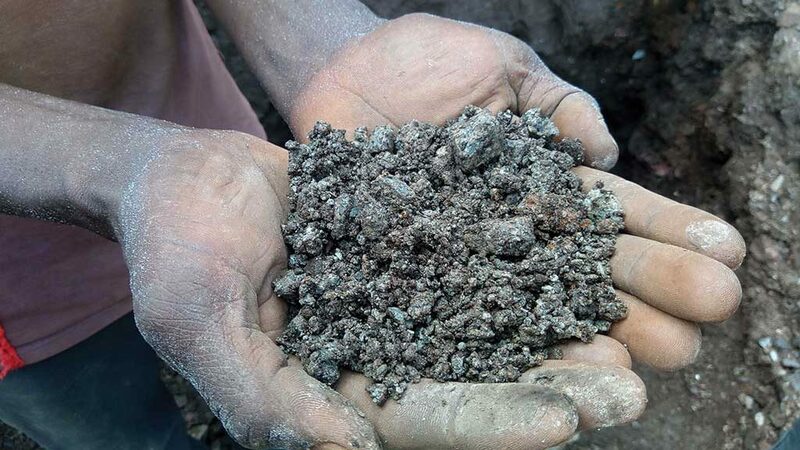 High-grade cobalt-copper ore from an artisanal mine site outside Kolwezi, DRC. Artisanal and small-scale mines in the DRC account for more than 12% of global cobalt supply. Credit: Cobalt Blockchain. If we take a look at production costs, we see that the cathode of a lithium ion battery makes up 33% of the manufactured cost. It’s important to note that despite its price, cobalt is not the sole driver of cathode cost. Industry insiders are more than happy to point the finger at expensive raw material costs for batteries because it is the easy target, given all of the discussion around its price appreciation. The reality is that companies are investing billions of dollars to bring on new cathode manufacturing capacity. This capex impacts cathode pricing because investments must be recovered and investors need to see a return. So as manufacturers continue investment in new capacity, it is expected that their ability to lower the cost of the battery is limited. Blaming high costs on raw materials deflects from the entire story.